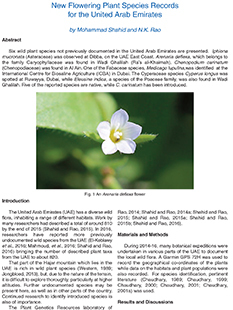 Six wild plant species not previously documented in the United Arab Emirates are presented. Iphiona mucronata (Asteraceae) was observed at Dibba, on the UAE East Coast. Arenaria deflexa, which belongs to the family Caryophyllaceae was found in Wadi Ghalilah (Ra’s al-Khaimah). Chenopodium carinatum (Chenopodiaceae) was found in Al Ain. One of the Fabaceae species, Medicago lupulina,was identified at the International Centre for Biosaline Agriculture (ICBA) in Dubai. The Cyperaceae species Cyperus longus was spotted at Ruwayya, Dubai, while Eleusine indica, a species of the Poaceae family, was also found in Wadi Ghalilah. Five of the reported species are native, while C. carinatum has been introduced.